Inoue Satsuki is a professor at Aichi University of the Arts, and her main field of research is the history of music in France. While researching the Paris World Fair of 1900, she had a surprise: in a list of instrument makers awarded prizes for their exhibits, she came across the name Suzuki Masakichi. So, in 2009, Professor Inoue started to research the life and legacy of Suzuki Masakichi (1859-1944). Even in Japan, research on him has been limited in scope and hardly anyone has pursued the question that intrigued Prof. Inoue more than any other. 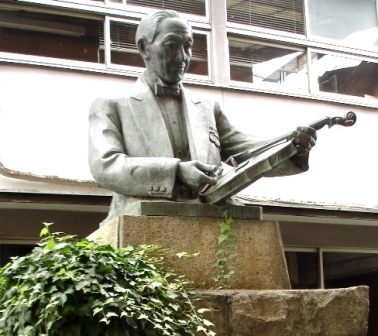 Suzuki is best known for pioneering the mass-production of violins in Japan, and this was hugely important for the dissemination of the violin among the Japanese. Towards the end of his life, however, he made several master instruments by hand. Inspired by the (Peter) Guarneri violin his son Shin’ichi – of Suzuki Method fame – brought home from Berlin, Masakichi embarked on the quest for the “secrets of Cremona”, like so many before him. Where, though are the instruments he built? – Few and far between, is the answer. Finally, thanks to an advertisement in the local paper, Prof. Inoue hit the jackpot: A Mr Matsuura contacted her. His father had bought a violin from Suzuki Masakichi himself, at the then astounding price of 300 yen. The instrument, dated 1929, was exquisitely made from the finest materials, which Suzuki had brought back from Europe himself. After saving the violin from the air raids of WW2 and the Ise Bay Typhoon of 1959, the Matsuuras had tried to sell it, but no shop was willing to pay for a fiddle with a Suzuki label in it – so strong was the association of Suzuki’s name with cheap, poor-quality instruments. Now, Mr Matsuura Tadayoshi has kindly donated the violin to Aichi University of the Arts. Its image decorates the cover of Prof. Inoue’s book. Suzuki Masakichi features in Not by Love Alone too, of course. I only wish I could have read Prof. Inoue’s excellent book before I finished the manuscript for my own. 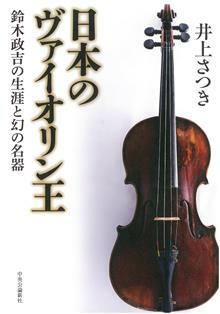 Still, I hope readers will find my chapters on violin making in Japan informative. INOUE, Satsuki. Nihon no Vaiorin-ô: Suzuki Masakichi no shôgai to maboroshi no meiki [Japan’s King of violins: The life of Suzuki Masakichi and the phantom of the famous master-instrument]. Tokyo: Chûô Kôron Shinsha, 2014.